This adorable 3-week-old foster kitten got a chance to explore the outdoors for the very first time earlier this month. Her foster dad uploaded this video of the tiny kitten, named Dash, picking her way gingerly through the grass. Luckily for her, Dash has a buddy encouraging her to be brave as she explores for the first time — her "foster dog father," a friendly golden retriever, is looking out for her. Whenever Dash goes to her forever home, she'll be a happier and more confident kitty, thanks to her foster family (both the humans and the dog). 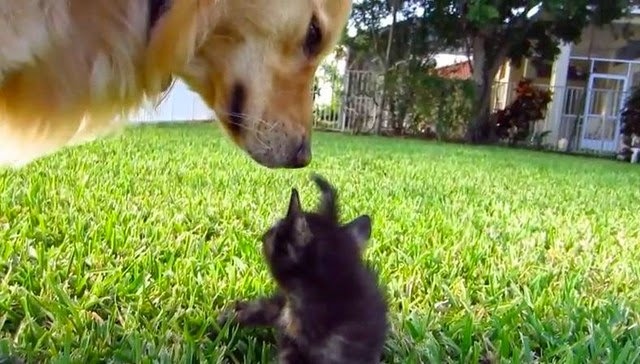 Responses to "Older Pup Shows Kitten That The World Isn't So Scary After All "